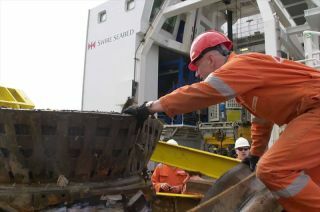 Amazon.com CEO Jeff Bezos inspects an F-1 engine part he and his team raised off the ocean floor in 2013. The Explorers Club has honored Bezos’ expedition with a Citation of Merit. The private expedition that successfully recovered historic NASA moon rocket engines from the ocean floor was honored in New York City on Saturday (March 15) by a venerable group of explorers, including an astronaut who rode to space atop those very same engines. The Apollo F-1 Engine Search and Recovery Team, as led by Amazon.com founder and chief executive Jeff Bezos, received the Citation of Merit from The Explorers Club, a professional society that promotes scientific exploration of the land, sea, air and space. The award was presented to Bezos by the club's president Alan Nichols and Apollo 11 astronaut Buzz Aldrin, who in 1969 joined Neil Armstrong to become the first men to walk on the moon. The floor of the Atlantic is littered with the wreckage of Apollo era rocket hardware. See how Jeff Bezos salvaged NASA Apollo moon rocket engines from the seafloor in this Space.com infographic. Financed by Bezos Expeditions, the F-1 Engine Recovery Project was launched in secret in 2011. In March 2012, Bezos announced to the world that he had located the F-1 engines on the seafloor, and, almost exactly a year later, revealed they had recovered the parts for at least two full enginesfrom a depth of over 14,000 feet (4,270 meters). "It is hard to find something [that is] more profound as an engineered object than an F-1 engine," Bezos said in a 10-minute video that premiered at The Explorers Club's 110th annual dinner. "[It was the] most powerful, single-chamber rocket engine ever designed and manufactured. Sixty-five of these engines flew and there were zero failures." The force of the impact with the water and ensuing plunge to the ocean's floor ripped apart the stage and its engines, leaving them almost unrecognizable. "The search and recovery effort took years of work," wrote Bezos on the expedition's website. "All along the way, this team worked long, hard and smart, and we had a ton of fun. Thanks to the team, soon a whole new generation of young people will be able to see these amazing engines on display." The more than 25,000 lbs. (11,340 kg) of engine parts that Bezos' team recovered were delivered in March 2013 to the Kansas Cosmosphere and Space Center, where a multi-year conservation effort is underway to preserve the F-1 artifacts for their display. In the course of their work, the conservators were able to identify at least one of the parts, a thrust chamber, had helped launch Apollo 11, the first manned lunar landing mission, in July 1969. "Apollo 11, I was five years old and it really was a seminal moment for me. I remember watching it on our living room TV," Bezos recalled. "That definitely became a passion of mine." Though Bezos financed their recovery, the engines remain federal property. NASA Administrator Charles Bolden has said the space agency plans to work with Bezos to place the preserved engine parts on public display. The venues for those exhibits has yet to be announced, but Bolden and Bezos have mentioned the Smithsonian's National Air and Space Museum in Washington, D.C. and Seattle's Museum of Flight, located near Bezos' Amazon offices, as potential recipients. "If this [exhibit] results in one young explorer, one young adventurer doing something amazing that helps the world, I'm totally fulfilled," Bezos stated. "Maybe they'll build the next F-1." Click through to collectSPACE.com to watch Bezos Expeditions' video presented at The Explorers Club’s 110th Annual Dinner.